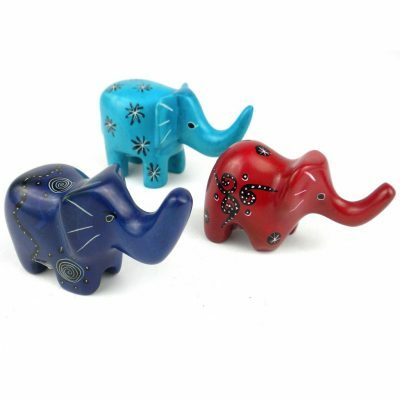 Set of three brightly colored elephants. 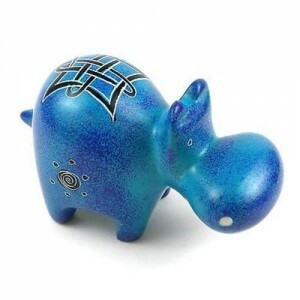 Each elephant is 2 inches tall, by 2.5 inches long and is hand painted with an abstract design. Colors and designs may not be exactly as pictured, we will select you three pieces in different colors. Our Soapstone is carved by the artists of SMOLArt a group of artists who live in the rural village of Tabaka, Kenya, the heart of soapstone crafts. The name, a shortened version of Small, Medium, and Large Artists, refers to the size of the soapstone products the artisans make, not their stature. Established in 1990, SMOLArt is a member of the WFTO, and as such assures that the artisans are paid a fair price for their work. In addition, the organization support community development by contributing to projects that improve living conditions, education, and health of their members and the village at large. 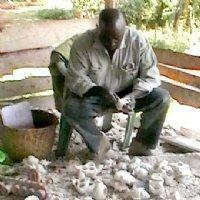 Soapstone is mined from great pits in the area surrounding Kiisi, Kenya. The mined soapstone is then delivered to carvers who carve sculptures from the natural stone for the wholesale market, the color of which ranges from cream, to pink, to brown, to yellow, to black, to a marbling of all of them. 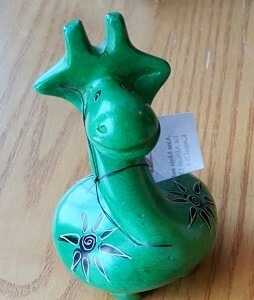 Once carved, the craftspeople smooth rough edges of the soapstone with sandpaper dipped in water and polish the piece to a high gloss or paint African motifs in brilliant colors with etched accents. All of the soapstone products we sell are completely handmade. The tools consist of household items from screwdrivers, hand drills, to switchblades. "Pangas," sword-like tools usually used for cutting down vegetation, are used to cleave the stone in the mines.